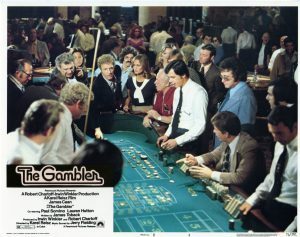 Karel Reiz’s The Gambler (1974) is a poetic, gritty drama that provides a valuable and realistic representation of the perils faced by the millions of Americans effected by problem gambling. 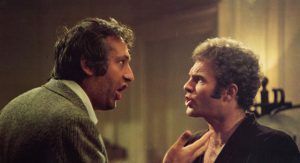 The film follows Axel Freed (James Caan) as he desperately exhausts every possible avenue to fuel his addiction to gambling. 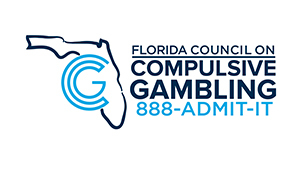 Additionally, the film provides insight to the harsh reality of problem gambling’s affects on personal relationships with a memorable performance by the supporting actors. 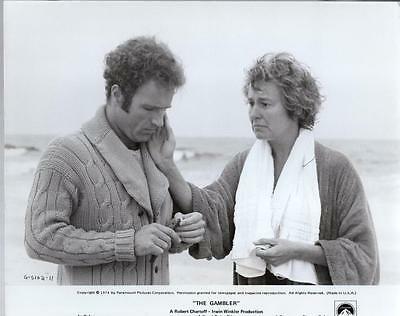 Freed (James Caan) and Bille (Laura Hutton) gamble in Vegas. Image property of Paramount Pictures. A frustrated Hips (Paul Sorvino) comes to collect what he is owed. Image property of Paramount Pictures. To his family, friends, and colleagues, Freed appears to be very successful—he is a Harvard educated literature professor, can quote poetry on a whim, and provides insightful, articulate commentary in almost any situation. Upon meeting his girlfriend Billie (Laura Hutton), Axel’s grandfather (A.R Lowenthal) disapproves noting that she is “not worthy of a scholar” as she is the type of woman who deserves “players and club boys. Yet, in stark contrast to this well-established professional life, Freed’s nights are spent with violent criminals, drug users, and mobsters. Despite his attempts to hide the severity of his addiction from those closest to him, as the film and his issues progress doing so becomes impossible. Axel reveals to his mother (Jacqueline Brookes) just how severe his situation is. Realizing he has no other option, Axel turns to his mother Naomi (Jacqueline Brookes), in hopes that she will bail him out of his debt. Like many mothers of addicts, Naomi blames herself for her son’s destructive behavior, claiming she is a “failure” for having a “son with the morals of a snake”. Freed does nothing to convince her that it is not her fault, and if anything, he guilts her into giving him the money saying “are you gonna give me the money or not?” Similarly, he tests his relationship with grandfather asking him for money to ensure he “can count on [him] if he needs to”. At one point Axel even casually asks his undergraduate students if they have “ten thousand of anything” to give him. Hoping her son will “come to terms with it all”, Naomi painfully withdraws $44,000 from the bank. Unfortunately, but not so surprisingly, the money is instead used to gamble. For Axel, and many individuals plagued with a gambling addiction, no amount of money (lost or won) is ever enough. Throughout the film, the audience watches Freed chase numerous loses, and blow his winnings on bets he “shouldn’t be making in the first place” as he constantly craves the “juice” juice of risk taking. As much as you may want to dislike Axel Freed, it is impossible as it becomes apparent that simply quitting gambling is not easy as it may sound.